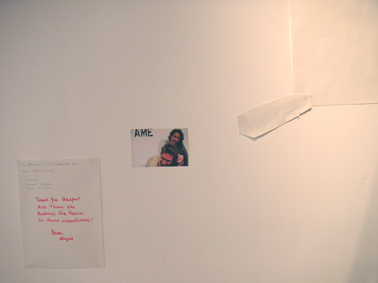 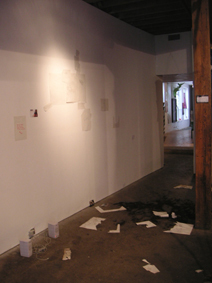 A photograph of the improvised vocal music band The New Noise Trio which had performed the previous day was attached to the westen gallery wall to the left of the cluster of drawings. 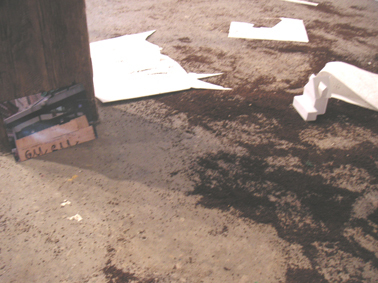 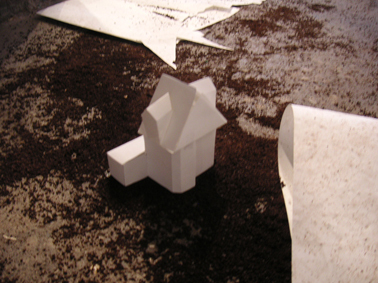 A small model of a house was constructed and placed among the coffeegrinds on the floor. 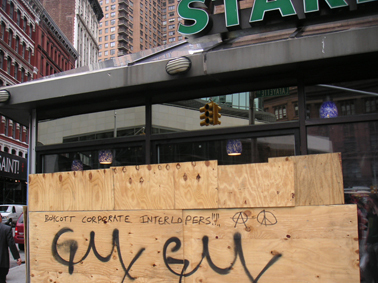 A photograph of graffiti bearing the slogan "boycot corporate interlopers" was also placed on the ground by the coffeegrinds, leaning against the pillar. 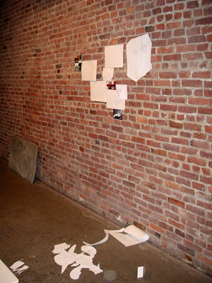 On the eastern wall by the cluster of drawings depicting a rehearsal space, and persons playing music among anarchy signs and palmtrees, a drawing of a figure walking on a street and passing by a building was placed. 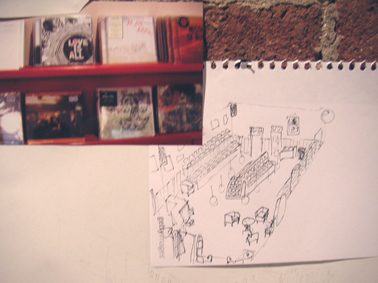 Upon this drawing was placed another one depicting the inside of a record store, and a photograph of some CD:s on a display shelf, including one by the band Love is All. 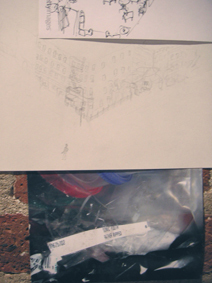 Below the drawing of the street the photograph of the "Sonic Youth Rather Ripped" label in the garbage was placed. 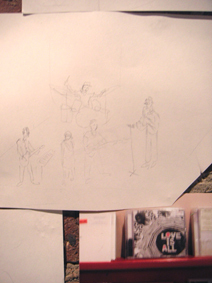 Above the photograph of the Love is All CD a cut-out drawing of the band Love is All performing on a stage was placed. 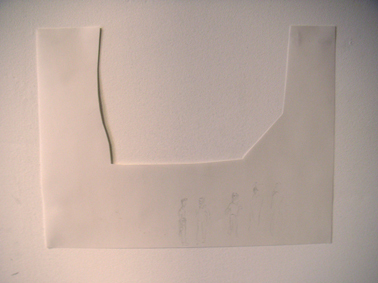 Above this cut-out drawing another drawing, of three figures barbequeing on a mountainside was placed. 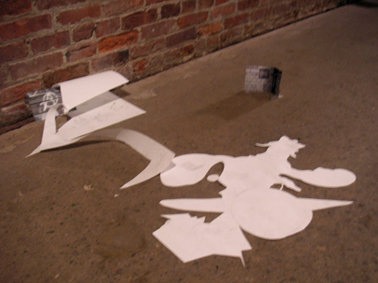 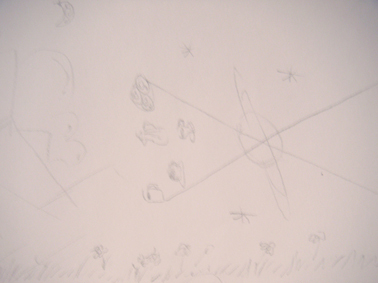 A cut-out drawing depicting the planet Saturn, two angels playing electric guitars, another angel playing a keyharp, two buildings, the planet Mars and a pyramid, was placed on the ground by the cut-out drawing of five figures. 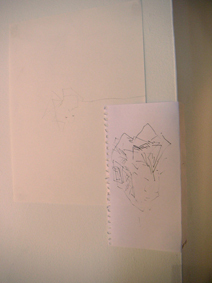 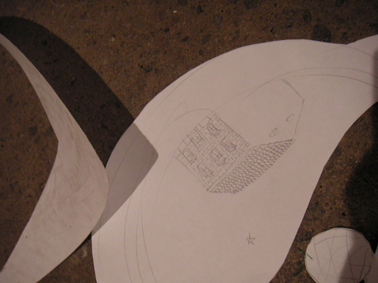 On the edge of the wall, next to the vague drawing of a face, another drawing of a face, this one angular in character, was placed. 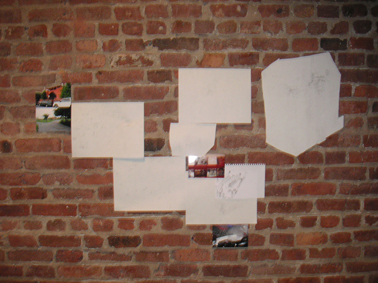 On the western wall, to the right of the cluster of drawings, a cut-out figure wearing a Sonic Youth t-shirt and gazing upwards at a combinded anarchy and peace sign was placed. 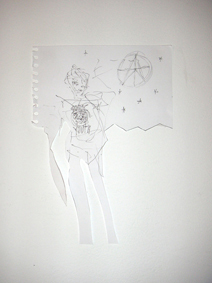 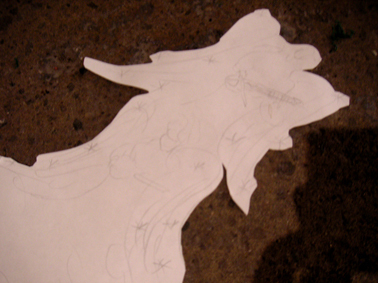 Another cut-out drawing of some figures were also placed there. 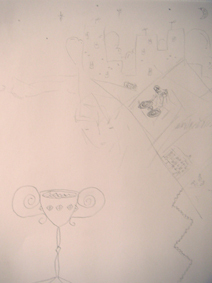 Yet another drawing, this one depicting a head, a figure DJ:ing records, a cityscape, some coffeecups, a coffeepot and a large chalice was also placed on the western wall to the right of the initial cluster of drawings.